1. 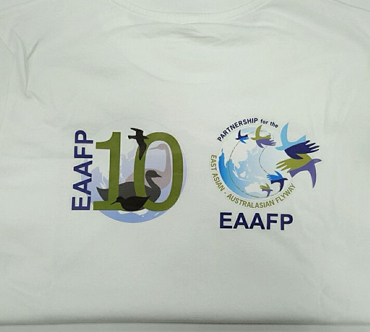 Please order at secretariat@eaaflyway.net with the subject [EAAFP souvenirs]. Please add information on which you would like to get from the three choices below. Please also write your name, shipment address, and your phone number. You will receive estimation including shipment fee through PayPal. 2. 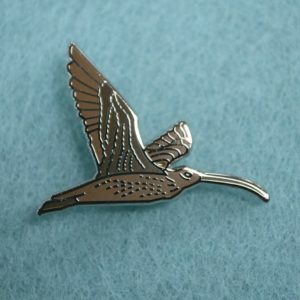 Once we have received your payment, we will send your souvenir ASAP. 100% of the money received through donations goes to developing materials for our CEPA activities. Donations can be sent through PayPal by clicking the button below. Please contact us for further enquiry. We will get in touch with you as soon as possible. 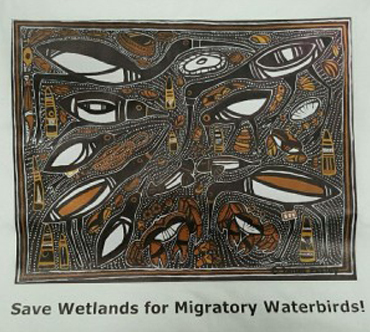 Save Wetlands for Migratory Waterbirds! 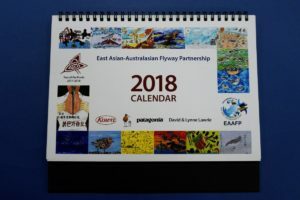 2016 marks the 10th anniversary of the launch of the East Asian-Australasian Flyway Partnership, which brings together 35 national governments, inter-governmental bodies, international NGOs and private sector organisations to save migratory waterbirds and their habitats in the Flyway for the benefit of people and biodiversity. This beautiful artwork comes from Red Knots: A Cultural Cartography of a Migratory Bird’s Annual Journey, conceived by Janet Essley in collaboration with the biologist Lee Tibbitts in order to raise awareness of Red Knots and other long-distance migrants in the East Asian-Australasian Flyway. 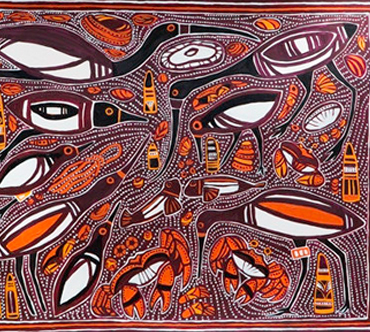 Janet carefully researched art styles from the different cultures in countries where the Red Knot spends time during its yearly migration, to produce a glorious collection of original work. 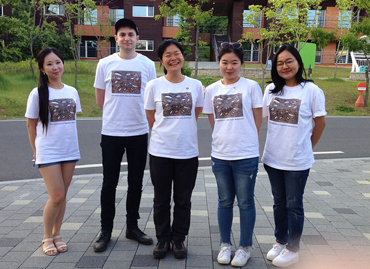 We sincerely hope that this T-shirt inspires people to consider the importance of migratory waterbirds and their habitats, especially tidal flats that are so important for so many species. The T-shirts sizes are S, M, L, XL and XXL. The price is KRW 15,000 each. Why have we made this T-shirts? 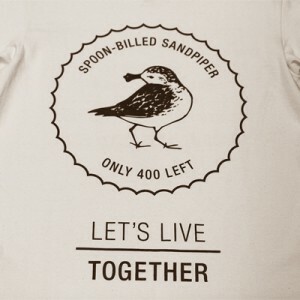 Spoon-billed Sandpiper is one of the most threatened species of the EAAF. Without our efforts, it could disappear from the world. 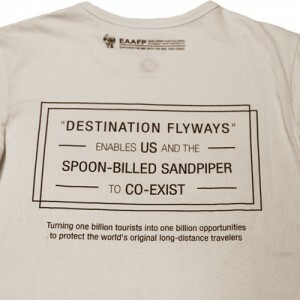 We’ve made this T-shirts to raise awareness on Spoon-billed Sandpipers and the crisis they are facing to. Please put on this T-shirts to support their survival and distribute our message to your family, friends and the world. This T-shirt was made of natural cotton, without going through any chemical treatment such as bleaching, optical whitening and dyeing, so it has ivory colour. Please avoid tumble-drying at high temperatures. The T-shirts sizes are now XS (18 available), S(21) and XXL (8) only. The price is KRW 15,000 each. 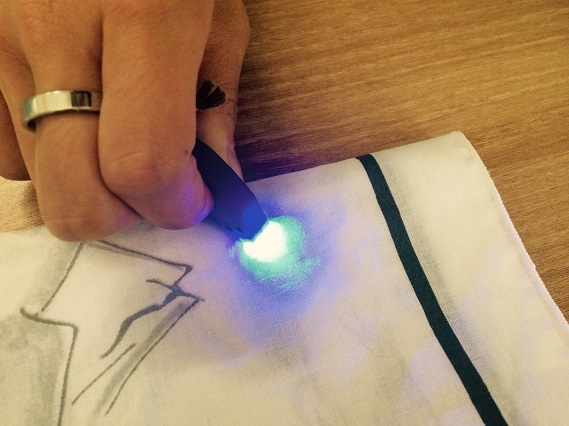 Why have we made this handkerchief? 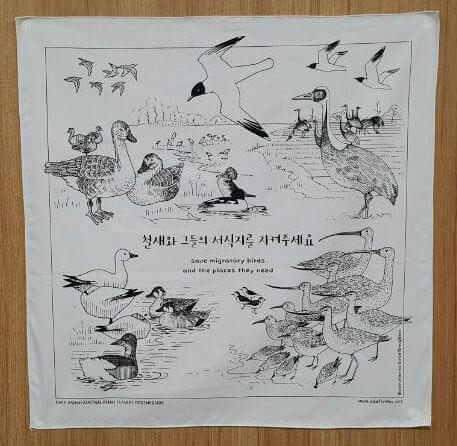 This handkerchief was produced to celebrate World Migratory Bird Day 2015 and spread its theme ‘Save migratory birds and the places they need’. 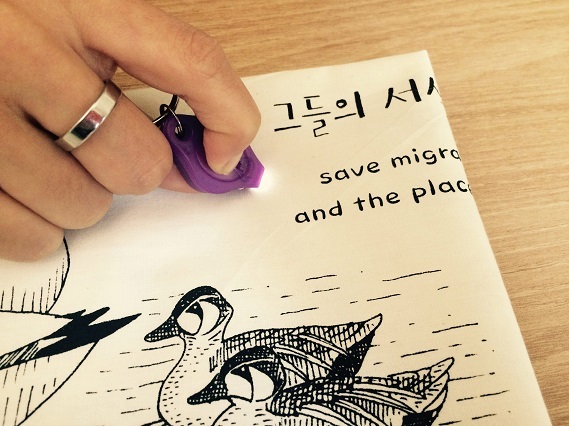 You can find beautifully drawn migratory waterbirds visiting the Republic of Korea on the handkerchief. This handkerchief was made of natural cotton, without going through any chemical treatment such as bleaching, optical brightening and dyeing (please refer to the images below), so it has an ivory colour. Please avoid tumble-drying at high temperatures. The size is 49cm by 49cm. The price is KRW 4,500. The ink colour is now dark brown. Why have we made this badge? 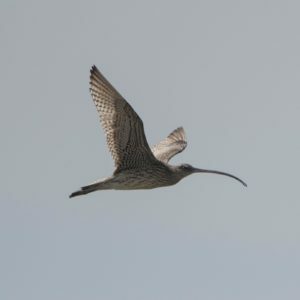 uman disturbance and possibly hunting (For further information, please visit our Far Eastern Curlew Task Force). 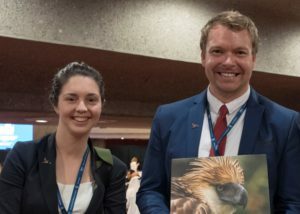 A lot of partners and supporters in the Convention on Migratory Species (CMS) joined us to spread our message. 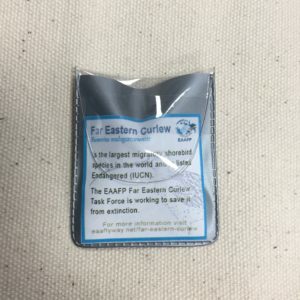 Please attach this badge to support their survival and deliver our message to your family, friends and the world. The badge size is 28mm*21mm. The price is KRW 3,000 each. We’ve made this calendar with artworks by the winners of the 2017 Knots Drawing Competition. The competition was held as a part of the awareness raising campaign “Year of the Knots 2017-2018” that calls for attention and urgent conservation actions to save Red Knots and Great Knots (For further information, please visit Year of the Knots 2017-2018). 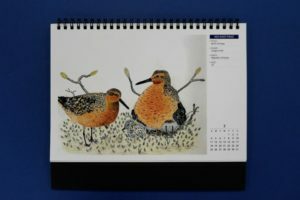 The awesome drawings in the calendar show coexistence between the knots and human beings as well as the beauty of these birds. 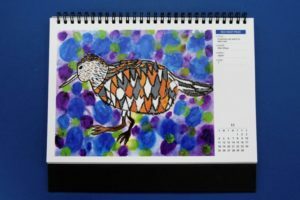 We believe this calendar inspires those who have the chance to see it and encourage them to work together for the conservation of the knots and other migratory waterbird species. Please help us spread the message. The price is KRW 7,000 each.